perhapablog... and other ramblings: happy birthday, joe and ramona~! happy birthday, joe and ramona~! great gets at the detroit comic con~! 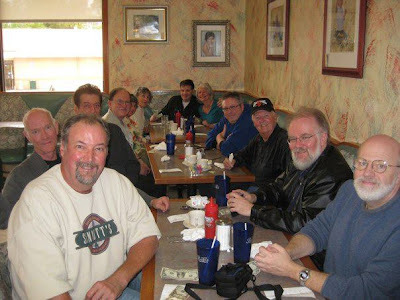 for those of you that are friends with walter or louise simonson on facebook, you may have already seen and heard that the infamous sinnott 17 gathered the other day to chat and eat and mostly to celebrate the 85 birthdays this month of both joltin' joe sinnot and the wonderful ramona fradon! several of our usuals weren't able to make it; fred and lynne hembeck, herbe trimpe and my pal jim starlin were sadly absent--but we were joined on this special occasion by legendary inker, tom palmer, and the incomparable john byrne! anyway, here's one walter took (so, sadly, he's not in it) with louise's camera that came out pretty good! ...and easily the greatest art team in comics, terry and john~! it was a wonderful day to celebrate two wonderful people and, though i might have to check this with john, i don't think i fanboyed out even once...! happy birthday, ramona and joe! some great captions/dialogues for eric's haps halloween cartoon the other day. thanks to everyone who took the time and added something of their own~! i gotta go and get some work done--but before i do, i should let you all know that ron marz, joe sinnott, fred hembeck, matthew dow smith, and myself--among many others--will be appearing at the one day only, ALBANY COMIC CON this sunday at the holiday inn on wolf road in albany! if you're in the area, come on by! it's a fun day and a fun way to get your halloween costume on! The reason Mr. Trimpe couldn't make it is probably because he's going to be down here in Richmond this weekend! So nyahh. I've said it before, I'll say it again, comic people are the best. Man that's an impressive grouping...you gotta get those Simonsons to come to Albany some one of these days.